Click Log In at the top of the website. Click the tab relating to the service you want to use for logging in and follow the login instructions. The first time you log in, you may be asked to approve the linkup between the service and Get Satisfaction. On the main Spotify page, type your question in the text box, and then click Continue. 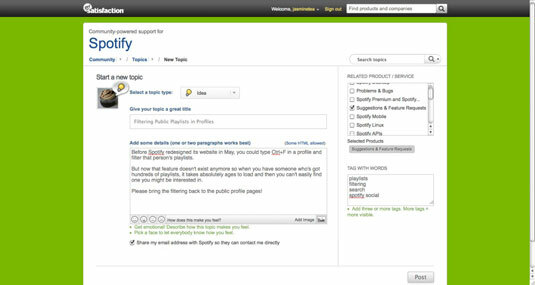 Spotify searches your question’s keywords to see whether other people have posted similar queries or comments, and then displays links to other questions people have asked, which it thinks are appropriate. You can click a suggested link if you think it’s relevant. If none of the suggested links look like they’ll solve your problem, click the Nope. Finish Posting My Question button. The Start a New Topic page appears. Select a topic type from the drop-down list. You can choose from Question, Idea, Problem, or Praise. Add a catchy title encapsulating your problem in the Give Your Topic a Great Title text box and include a description in the Add Some Details text box. (Optional) Uncheck the option to share your e-mail address with Spotify if you don’t want them to contact you directly with a solution. On the right side of the page, in the Related Product/Service section, select the check box next to which product or service relates to your topic. In the Tag with Words text box, enter three or more tags to your comment, including one on each line. To tag a phrase, put it in quotes. These tags can help other people search for the same problem. You’re redirected to the Spotify forum, where other people can view (and hopefully answer!) your question.